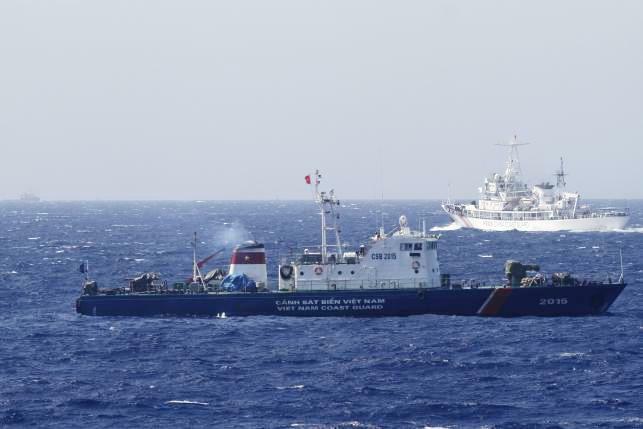 A ship (top) of the Chinese Coast Guard is seen near a ship of the Vietnam Marine Guard in the East Vietnam Sea, about 210 km (130 miles) off the shore of Vietnam, in this May 14, 2014 file photo. NEW DELHI/HONG KONG, Jan 25 – India will set up a satellite tracking and imaging centre in southern Vietnam that will give Hanoi access to pictures from Indian earth observation satellites that cover the region, including China and the East Vietnam Sea, Indian officials said. While billed as a civilian facility – earth observation satellites have agricultural, scientific and environmental applications – security experts said improved imaging technology meant the pictures could also be used for military purposes. Hanoi especially has been looking for advanced intelligence, surveillance and reconnaissance technologies as tensions rise with China over the East Vietnam Sea, they said. "In military terms, this move could be quite significant," said Collin Koh, a marine security expert at Singapore's S. Rajaratnam School of International Studies. "It looks like a win-win for both sides, filling significant holes for the Vietnamese and expanding the range for the Indians." But unlike the other overseas stations, the facility will also be equipped to receive images from India's earth observation satellites that Vietnam can use in return for granting India the tracking site, said an Indian government official connected with the space programme. "This is a sort of quid pro quo which will enable Vietnam to receive IRS (Indian remote sensing) pictures directly, that is, without asking India," said the official, who declined to be identified because he was not authorised to speak to the media. "Obviously it will include parts of China of interest to Vietnam." Chinese coastal naval bases, the operations of Beijing’s coastguard and navy and the new man-made islands it built in the Spratly archipelago of the East Vietnam Sea would be targets of Vietnamese interest, security experts said. "This is at the beginning stages, we are still in dialogue with Vietnamese authorities," said Karnik. Vietnam's Foreign Ministry confirmed the project, but provided few other details. China's Defence Ministry said the proposed tracking station wasn't a military issue. The Chinese Foreign Ministry had no immediate comment. "The advance of technology means the lines are blurring between civilian and military satellites," said Trevor Hollingsbee, a retired naval intelligence analyst with Britain's Defence Ministry. "In some cases, the imagery from a modern civilian satellite is good enough for military use." India has extended a $100 million credit line for Hanoi to buy patrol boats and is training Vietnamese submariners in India while Hanoi has granted oil exploration blocks to India in waters off Vietnam. "You want to engage Vietnam in every sphere. The reason is obvious - China," said retired Indian Air Force group captain Ajay Lele at the New Delhi-based Institute for Defence Studies and Analyses. Both India and Vietnam are also modernising their militaries in the face of Beijing's growing assertiveness, having separately fought wars with China in past decades. Australian-based scholar Carl Thayer, who has studied Vietnam's military since the late 1960s, said the satellite tracking facility showed both nations wanted to enhance security ties. Their interests are converging over China and the East Vietnam Sea, he said.